I am always looking for ways to cram as many veggies as possible into my meals but sometimes it is hard for me to actually choke down the amount I know I need even though I usually enjoy them. One night, not too long ago, I was tired and barely able to keep my eyes open due to a sadistic workout(s) CJ made me do earlier in the day. I wanted to make something quick and healthy but also hearty and delicious. 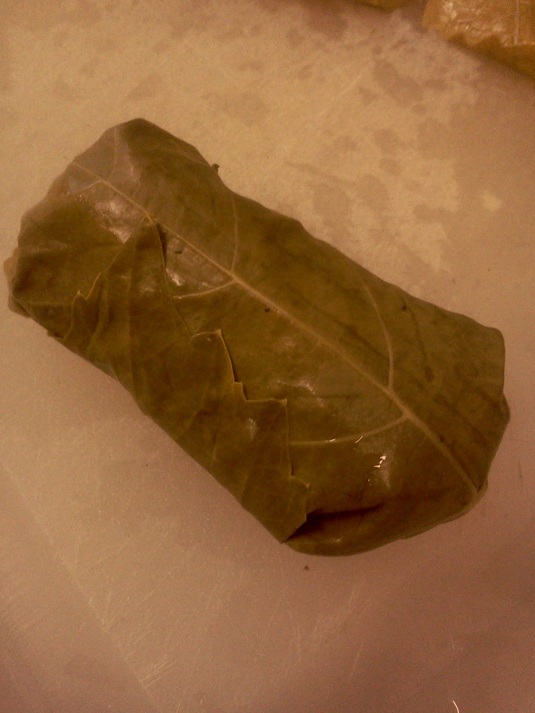 I came up with what would be the filling of my dolmas although that night I just piled it on a couple handfuls of arugula. It was two days later that using the mixture for dolmas came to me in a dream and I decided to test the recipe out on a bunch of brunchers. It was a hit and therefore worthy to pass along to you. I am especially proud of the fact that nobody knew there was a zucchini hidden inside. This recipe could probably trick a bunch of picky kids, or maybe even a Pops, into eating a secret serving of green stuff. In a food processor, finely mince the zucchini, garlic, and onion. 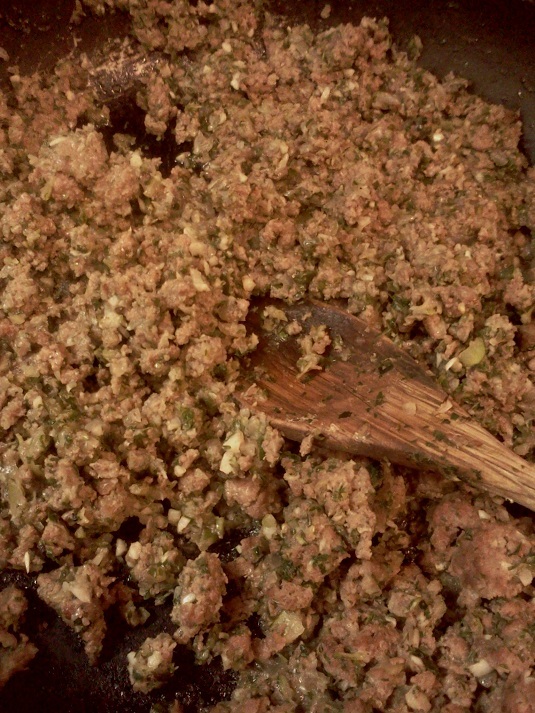 Put all ingredients EXCEPT MINT into a pan and cook over medium-high heat until meat is cooked and any juices cook off. Turn off heat. Finely chop the mint and add to the warm mixture. Let cool enough to handle. 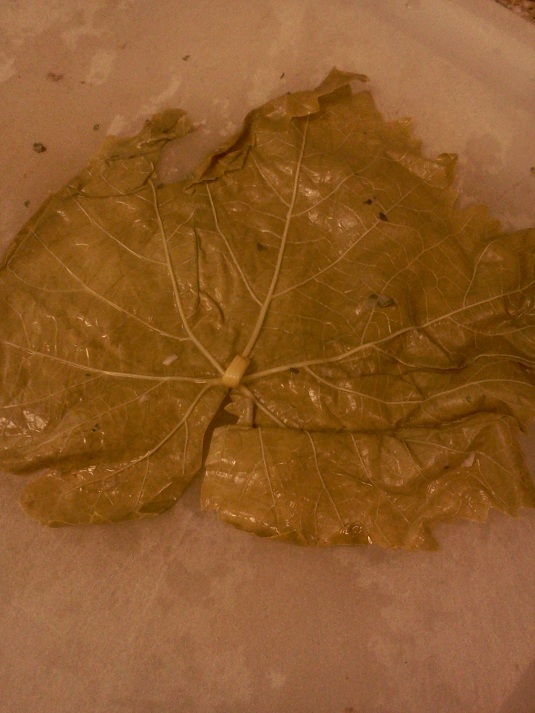 Rinse the grape leaves and pat them dry then lay them out on a cutting board or sheet pan. 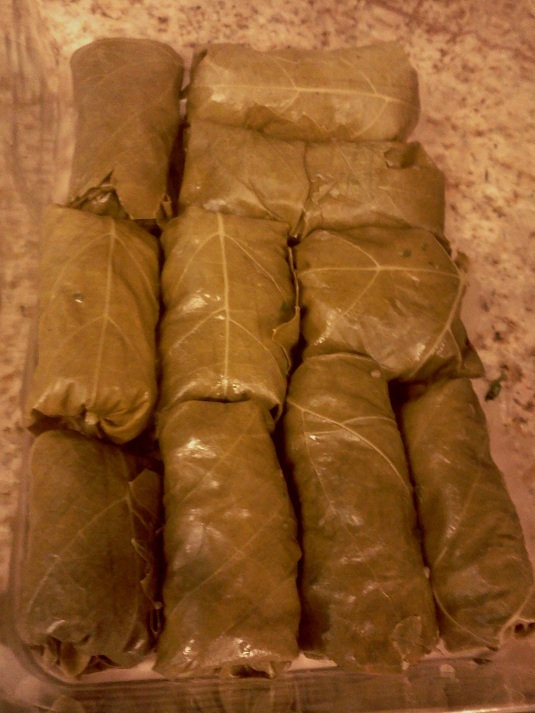 Place a small handful (a few tablespoons) of filling onto each grape leaf and then roll them up like a little burrito by wrapping one long side over then flipping each end down and rolling shut. Repeat process until filling is used up. These can be served hot, cold, or at room temperature and can be made a day or two in advance and taken to parties, brunches, or in your lunch for tomorrow. Enjoy.